Having spent a good forty-five years musing on various aspects of the cultural phenomenon formerly known as Robert Zimmerman I reckon I’ve just about got him figured out. That might seem like a big call, what with the chopping and changing that has gone on through thirty-five studio albums and fifty years of twists, turns and changes of disguise. Given that chopping and changing the first thing you’re tempted to do when faced with a new Dylan album is to figure out where it fits into the jigsaw puzzle, but I’m inclined to go back to the formative era of the fifties and look at what followed filtered through a sensibility of a bloke who plays some guitar and a bit of piano, writes stuff and has a go at vocalising it. Much of the prodigious output of written commentary that has emerged over the five decades he’s been with us has, I think, come from the multitude of proto-Dylans you’d have found scattered across the countryside sitting in dimly lit bedrooms, bedsits and college dormitories, reading the Beat poets and their antecedents, musing on various forms of mysticism and tapping things out on typewriters under the influence of whatever substances they were using to fuel their visions. Most of them, in one sense or another stayed there mentally, many of them forced to modify the old bohemian tendencies by the need to earn a living and provide for wives and children but one of the multitude of proto-Dylans didn’t, and that’s where things get complicated. 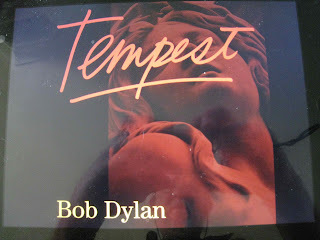 A combination of opportunism, manipulation, plagiarism and fusion shaped a career that progressed to the point where Dylan has been able to do more or less what he likes, and what he delivers is misunderstood and misinterpreted by a multitude of thought they could have beens who base their reaction to Dylan on what they think they would have thought, done, written and sung in the same perceived position. So when Duquesne Whistle kicks off Tempest with a jaunty Western swing most of us are left scratching our heads, wondering if there’s anything more to it than meets the first glance and, when we decide there must be, trying to figure out what it is. What it is, of course, is a bloke who plays some guitar and a bit of piano, writes stuff and has a go at vocalising it who’s managed to get a pretty decent road band together and, from time to time, has a go at some new material with that band and a few extra instrumental assistants like Los Lobos’ David Hidalgo. That’s why we get the predictable kerfuffle about plagiarism and related issues. The old bower bird’s never been too concerned about lifting bits and pieces from all over the place, and I’m sure someone with a better knowledge of Western swing than I have would take a listen to Duquesne Whistle and rattle off a couple of tracks that work around a remarkably similar set of licks. Flick over to Early Roman Kings and you could spend a couple of minutes enumerating the Chicago blues tracks he’s borrowed. On that basis I’m inclined to be choosy about my Dylan albums. Up to John Wesley Harding, through what I’m inclined to call the classic amphetamine and red wine powered word spinning era I’m fine. Blonde on Blonde and Highway 61 Revisited are the incarnations I particularly like, but looking back on things in the cold hard light of historical reality he probably went into those sessions with a couple of sheaves of typescript and a few rudimentary ideas about tunes they might fit in with. Which probably isn’t too different from what he did when the time came to cut Tempest. There’ll be a couple more runs through the album once this review’s posted, but I’ve already discarded the title track and Roll On John isn't far off the same fate. Of the rest, Duquesne Whistle is a definite keeper, swinging along like it’s going out of fashion and it genuinely sounds like everyone on board is having a good dash of old-fashioned 100% fun. Soon After Midnight might be rather obvious when it comes to rhymes (money/honey, fearful/cheerful, harlot/scarlet), but there’s a band locked into a languid groove and there’s a healthy dose of Highway 61 Revisited and Blonde On Blonde on the rollicking Narrow Way. It’s not quite Rainy Day Women but it’s not far off. Seven minutes of experienced road warriors running through something they’ve just about got off by heart (the feel, rather than the actual tune, though it’s awful familiar, as are those guitar licks behind the vocal). Long and Wasted Years maintains that groove, with the band playing something that’s deeply internalised they could do it in a coma. Four tracks, four keepers that won’t have the shuffle button being called into action on a regular basis. You could say much the same about Pay In Blood, where the weatherbeaten voice is an ideal match for the lyrical content. Some dodgy rhymes, sure, but that’s hardly a new development where Dylan’s concerned. Things drop back a notch for Scarlet Town, though the minimal riff is as persistent as its brothers have been throughout and the bleakness continues through the lyrics. Your mileage may vary as far as Early Roman Kings is concerned, particularly if you have a degree of difficulty aligning the title with the lyrical content, though you might also see the riff as being a little too closely related to Muddy Waters’ I’m a Man. I’m inclined to think we’re talking the Mafia or some similar organization for the lyrical content, though mileages will invariably vary. For mine, the wheels start to fall off once Dylan moves from observation, allegory or whatever figurative tag you choose into narrative. There’s plenty of narrative in the sources from which Dylan draws his material, and the murder/revenge quest manhunt tracking down an abducted wife in Tin Angel works reasonably well. 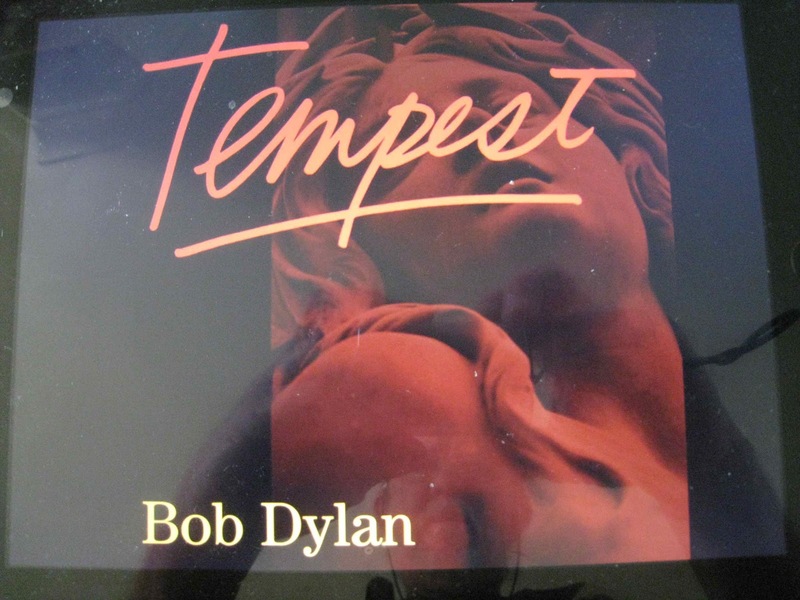 On the other hand, close to fourteen minutes of Tempest has been moved into shuffle forward territory. I’m not overly rapt in Roll On John which is probably skirting dangerously close to the same fate. So where are we on studio album number thirty-five? And, more significantly, he’s still going, and hasn’t, it seems, surrendered to the all-too-familiar urge to keep oneself going by regurgitating what we’ve done in our notional heyday.